To be able to read such a story, by such a respected author in just a couple of hours, you really have nothing to lose, even if you hate it (which you won’t). The story is told from the perspective of a long long time inmate of Shawshank prison, named Red. A man named Andy Dufresne is jailed for the murder of his wife and her lover, and over the course of 27 years, befriends most everyone from Red, to the screws (the guards), and many other inmates, even a warden or two. Andy is so well liked that he somehow is allowed to bunk on his own, in the very same cell, for all of those 27 years. I have to say that it sometimes bothers me when a book crosses over the “present” line. The story starts as a memory, and at some point, the past catches up to the present and either continues on in real time, which can be done very well or very painfully, or sometimes there is another time jump, to a second telling of a past event. In this case, the latter happened, and I felt like it made sense, but was a bit weird. Maybe I am comparing it to the movie here, but the time perspective could have been done better. The language in the book felt too clean for a prison setting, but did feel plausible aside from that.. I found Red’s anxiety about “the outside” particularly interesting, as well as his assumptions about how Andy Dufresne felt about being in prison versus out of prison. With most books I have read and also seen the movie, I would say the book is definitely better, so skip the movie. However in this case, see both. The movie does not take away anything from the book, only adds excitement. And the book tells you exactly where the movie is coming from and how it started, Uniquely, it takes about the same amount of time to watch the movie as it does to read the book, and both are well worth the time you spend. Want to read more books that have made it to the big screen? Try this list: books on Film. This entry was posted in Muse Reviews and tagged Andy Dufresne, Books made into film, Crossing the Present line, Nothing to lose, Rita Hayworth, Shawshank prison, Stephen King, worth the time. Bookmark the permalink. ← Ten Reasons (You’ve Probably Never Thought About) Why Reading is Awesome! 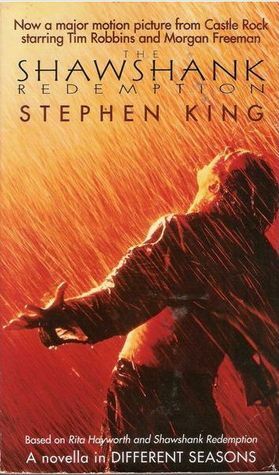 This is usually the first story I recommend to people that claim they don’t like Stephen King. Once I get them there, then it is 11/22/63.